Pioneer Ent./Geneon(original licensor); FUNimation(new licensor) AIC, Kadokawa Shoten, Pioneer Ent. How can anyone explain that a 16 year-old girl would walk up to a 17 year-old boy - and call him "Daddy"? One day, a girl named Mayuka arrives at the Masaki residence, claiming to be Tenchi's daughter! This obviously causes quite a ruckus! As the scramble to discover the true origin of Mayuka, the girls adjust to the new presence at their home. However, they soon learn that Mayuka speaks the truth, and her origin dates back to the past, involving a menacing demon named Yuzuha. Yuzuha is preying on the Masaki's for vengeance against them, with a grudge dating back to Startica, a Juraian Holiday. 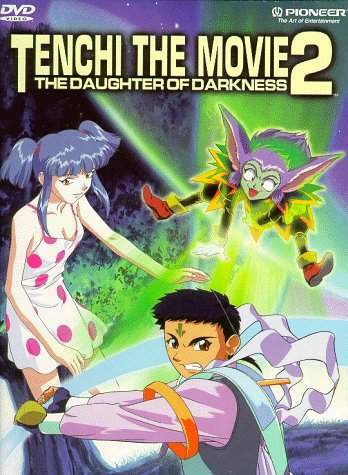 Mayuka, being unwittingly controlled by Yuzuha, eventually puts Tenchi and the gang in extreme peril. Will they be able to defeat Yuzuha and save Mayuka? The above description came from atomofish and Elwin Blaine Coldiron, and was edited by yours truly (contact me).